Welcome to iTravelTelAviv.com (Hereinafter: “iTravelTelAviv”, “The Site” or “The Web Site”). Use of this site is governed by the Terms and Conditions set forth. The section headings used in this agreement are solely for the convenience of the reader and shall not be given any legal import. The following terminology applies to these Terms and Conditions, Privacy Statement and Disclaimer and any or all agreements: “User”, “You” and “Your” refers to you, the person accessing this website and accepting the Company’s terms and conditions. “The Company”, “The Site”, “The Web Site”, “We” and “Us”, refers to our Company. “Party”, “Parties”, or “”Us”, refers to both the users and the web site, or either the user or the web site. All terms refer to the offer, acceptance, consideration or payment necessary to undertake the process of our assistance to the user in the most appropriate manner, whether by formal meetings of a fixed duration, or any means, for the express purpose of meeting the user’s needs in respect of provision of the web site’s stated services/products, in accordance with and subject to prevailing Israeli Law. Any use of the above terminology or other words in the singular, plural, capitalization and/or he/she or they, are taken as interchangeable. The information and materials provided by iTravelTelAviv may be used for informational purposes only. By using, accessing or downloading materials from this Web site you agree to follow the terms and provisions as outlined in this legal notice, which apply to all visits to the iTravelTelAviv Web site, both now and in the future. The web site may at any time change, edit, revise and update the Terms and Conditions. You are encouraged to periodically visit this page to review the most current Terms and Conditions by which you are bound. If you do not agree to these Terms and Condition, please do not use this Web site. During use of the Site, the User might contract with a third party for the purpose of obtaining or booking services, including services for payment. Contracts as afore said between the User and a third party, even where the service relates to content on the Site, shall be between the User and the third party only, and the Company shall not be a party thereto. iTravelTelAviv shall not bear any liability in respect of any activity and/or service received by the User from third parties as aforesaid, or in respect of any contract between the User and a third party, even if the service or contract directly or indirectly relate to activity of the Company and/or the Site. iTravelTelAviv’s hotel booking is powered and operated by HotelsCombined.co.il. HotelsCombined.co.il is a hotel price comparison engine, and works with multiple partner websites to which you click through to make reservations. If you have made a booking using HotelsCombined.co.il, hotel websites or any other booking service, you will need to contact the website on which you made the booking to discuss your reservation. View a complete list of partner websites. 2.2 ALL TICKETS TO ATTRACTIONS AND TOURS are booked directly through the reservation system of the Venues, Museums, Tour Operators. For any concerns, inquiries, changes on your reservation, or cancellations please contact the venues directly. 3.1. IN USING THIS WEBSITE YOU ARE DEEMED TO HAVE READ AND AGREED TO THE FOLLOWING TERMS AND CONDITIONS. 3.2. This web site is based in Israel, and is conducted by and under the laws of the State of Israel. The purpose of the site is to promote tourism to Jerusalem and the Holy Land, and to provide users with travel information on the region. 3.3. These conditions apply to the use of the contents contained on the web site through a computer or any other communication device (including, but not limited to a mobile and cellular phones, PDA’s and other various end-user devices). These terms and conditions also apply to the use of the site through the internet or any network or other means of communication. 3.4. iTravelTelAviv reserves the right to change these terms and conditions without obtaining the user’s consent. You are encouraged to read these terms and conditions in your future visits to the web site, and to be always updated about the terms and conditions of use in this web site. 3.5. Regarding any question on the use of the site you may contact iTravelTelAviv representatives at [email protected]. 4.1. You agree that your use of this site, your reliance on any material contained in this site and any uploads, comments or any other information you may gain, use or give on this site, are at your own risk. 4.2. iTravelTelAviv will take efforts to make the site and all the materials in it free of malicious programs and/or viruses. However, the web site and all the materials in it are provided “as is” and, to the fullest extent permitted by law, are provided without warranties of any kind, either express or implied. This means, without limitation, that iTravelTelAviv DOES NOT WARRANT that the web site is fit for any particular purpose; that the functions contained in the materials of the site will be uninterrupted; that defects will be corrected; that the site is free of viruses and other harmful components or that the site is accurate, error free or reliable. 4.3. You acknowledge that iTravelTelAviv and third party content providers, their partners and affiliates together with their respective employees, agents, directors, officers and shareholders, ARE NOT LIABLE for any delays, inaccuracies, failures, errors, omissions, interruptions, deletions, defects, viruses, communication line failures or for the theft, destruction, damage or unauthorized access to your computer system or network. 4.4. You acknowledge that iTravelTelAviv is not liable for any defamatory, offensive or illegal conduct or material found in connection with this site, including such conduct or material transmitted by any means by any other person. 4.5. You acknowledge that iTravelTelAviv and third party content providers are not liable for any damages, including, without limitation, direct, incidental, special, and consequential or punitive damages, in connection with or arising from your use or from your inability to use the site. 4.6. With respect to any content provided by you and/or users or other submissions, iTravelTelAviv is merely a distributor of such content. iTravelTelAviv is not and will not be responsible for any content submitted by users or other third parties, including opinions, judgments, advice, statements, pictures, designs, trademarks, texts, services or any other kind of information. iTravelTelAviv shall not be liable for any loss or damage caused by any reliance upon such information obtained and/or uploaded through the web site. It is solely your responsibility to evaluate the accuracy, completeness, or usefulness of any content. 5.1. iTravelTelAviv does everything it can to ensure the credibility and accuracy of the information contained on the site, but it cannot guarantee reliability and accuracy of such information. If you discover inaccuracy in such information, please notify us about it at: [email protected]. 5.2. iTravelTelAviv reserves the sole right to make any changes to the web site at any time for any reason, without prior notice, without your consent and/or knowledge and without any liability for such changes. 5.3. iTravelTelAviv may close the site and/or change it from time to time, change the content, structure, appearance and availability of services provided, without prior notice, without your consent and/or knowledge and without any liability for such changes and acts. 6.1. You and/or anyone on your behalf will not operate or allow operation of or upload any computer application or program or any other means or measures (including but not limited to Worms, Crawlers, Viruses, Trojan horses and Robots), for searching, scanning, copying or automatic retrieval of content from the web site. You expressly agree not to create and not to use any means to create a digest, as stated, or a collection reservoir that will contain content from the web site. 6.2. You and/or anyone on your behalf will not display content from the web site in any way, including through any software, instrument, accessory, web site or communication protocol, web site design or any other content, in particular advertisements and commercial content. 6.3. You and/or anyone on your behalf acknowledge that it is strictly prohibited to make changes to or copy, distribute, transmit, display, perform, reproduce, publish, issue a license, create derivative works from or sell an item, information, software, products or services from the site. 6.4. The Services on the web site may contain areas in which users may upload content of any kind, write reviews, communicate with each other and/or with the web site (Hereinafter: “Communication Services”). • Harass, “stalk”, threaten, abuse, defame or violate in any other way the legal rights of others. • Upload, publish, post, or collect any material that is defamatory, indecent, inappropriate or unlawful. • Upload, publish, post, or collect any material that is libelous, or is an invasion of privacy or publicity rights or any other third party rights; or are for commercial purposes or contain advertising or are intended to solicit a person to buy or sell services or to make donations; or include information of any kind that may mislead a consumer. • Upload, publish, post, or collect any material that may constitute a criminal offense, gives rise to civil liability or violate any state, local, national or international law. • Collect or “harvest” information about any other user, including, but not limited to users’ e-mail addresses. • Upload, publish, post, or collect any material that may infringe any rights of any party, including but not limited to intellectual property rights such as trademarks, copyrights, trade secrets, designs and patents. • Use the web site in relation and/or in connection with “spam” or “junk” mail of any kind (commercial or personal). • Improperly assume or claim the identity, characteristics or qualifications of another person. • Upload, publish or post commercial information of any kind, unless you have asked iTravelTelAviv’s consent and have received its prior and written consent to such use. 5.6. You acknowledge that communication and information to and from the web site are not confidential. 7.1. This site may contain and/or include hyperlinks, links and feeds that provide information and services, including but not limited to weather forecast information (hereinafter: “the links”), to information resources or other resources located on other web sites (hereinafter: “other sources”). 7.2. The links are provided on the website solely for your convenience and the inclusion of the links in the web site does not imply any authorization and or a “seal of approval” for the content, data or information of any kind published in the links. 7.3. iTravelTelAviv is unable to control any of the content, data or information of any kind that is published in the links, and therefore iTravelTelAviv is not responsible for such content, data or information. 7.4. There is no guarantee that all links on iTravelTelAviv will lead to active web sites. 7.5. Without derogating from the above, iTravelTelAviv will not be held liable for any direct or indirect damage, caused to you or your property resulting from using or relying on the content, data or information from the links. iTravelTelAviv will not be held liable for any indirect or direct damage due to your use of or reliance on information posted on the web site by any third party. 8.1. 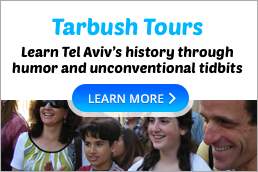 Due to the nature of the tours and shore excursions offered and presented within the web site, iTravelTelAviv uses the service of independent certified tour guides and local tour operators. iTravelTelAviv, its employees, agents, representatives, associates and their heirs, executors, predecessors and successors, all and each one of them is waived and released from all claims, demands, actions or causes of action in law or equity which each may or might have against iTravelTelAviv or any of them by reason of any loss, damages, injuries (to person or property) or death sustained or occasioned directly or indirectly as a result of any participation in any tour or shore excursion presented on iTravelTelAviv’s website. 8.2. The tour rates are per person or per vehicle, and they are presented in U.S. Dollars. ITravelTelAviv reserves the right to changes tour rates without prior notice. 8.3. Any cancellation must be done with a 24 hour notice prior to the tour’s or shore excursion’s departure time. A cancellation notice which will be presented less than 24 hours before the set date of tour and/or flight and/or departure and/or any other service ordered form the web site, the user will be charged 50% of the entire tour or service cost. No shows will be fully charged, and can be accommodated on a standby for any open space on the following tour departure. For rescheduling your tour due to bad weather please notify iTravelTelAviv first. You will not be charged for cancellations due to weather conditions or no shows by your cruise ship. 8.4. Your credit card information is used ONLY to secure your space in the tour or in case of a No Show. Full payment will be processed by Users’ tour representative upon User arrival. 9.1. iTravelTelAviv intends to maintain an adequate and safe operational level of the web site and services provided to the User. Please report to us any problems and/or offensive content and/or any breach of policy. 9.2. It is iTravelTelAviv’s intent to make sure that the services offered on the site do not violate copyright, trademark rights or any other rights of any third party. If you are concerned that such rights have been infringed, please send a message as soon as possible to e-mail: [email protected]. 9.3. iTravelTelAviv cannot ensure that users on the site have the rights to material, information and other content uploaded by them to the site, thus we will need your help to identify items that violate rights. 10.1. iTravelTelAviv cannot and does not monitor or review any information uploaded to the web site or information automatically uploaded to the site. 10.2. iTravelTelAviv encourages freedom of expression and the existence of a fruitful dialogue on the site, with active participation of users on the site. However, in order to allow the existence of a cultural dialogue and to prevent the abuse of freedom of expression on the site, iTravelTelAviv reserves the right to remove any content that infringes third party rights whether through breach of copyright, intellectual property rights trademarks, slander, violation of privacy, publication of pornographic content that may be inappropriate to minors, harm to the good name and reputation of third parties and the like. 10.3. iTravelTelAviv may turn away users and block access to users, without any need to provide a reason or explanation, if such user content infringes third party rights through the breach of copyright, intellectual property rights trademarks, slander, violation of privacy, publication of pornographic content that may be inappropriate to minors, harm to the good name and reputation of third parties and the like. 10.4. iTravelTelAviv reserves the right, at all times, to disclose any information to others who require from it by law, as well as the right to edit, remove, refuse to upload to the site or publish on the site any content, data or information which iTravelTelAviv believes to be offensive or in violation of terms of this agreement. 10.5. ITravelTelAviv does not sponsor any user content nor provide an opinion as to the correctness or accuracy of the statements, advice or other information displayed on the web site by various users or any third party. You acknowledge and are aware that any reliance on statements, opinions, advice or other information displayed on the site is made according to your opinion and at your own risk. 10.6. iTravelTelAviv may refuse to publish content that violates the above and/or may damage the site and/or any third party, and reserves the right to delete such content at any time. 10.7. iTravelTelAviv is not obligated to retain information uploaded to the site. iTravelTelAviv is not obligated to continue publishing information published on the site. 10.8. iTravelTelAviv recommends you to be extra cautious in connection with the content published by you or by others on the web site. iTravelTelAviv recommends that you be extra cautious with regard to professional information contained on the site. This information does not constitute an alternative to professional advice, and is a recommendation only. 10.9. As mentioned above, your use of any information, content or data that is on the web site will be at your own risk. 11.1. You agree that any action performed by you through this web site, does not violate the laws of the territory you are using this web site from. 12.1. You agree to defend, indemnify and hold harmless iTravel-Jerusalem.com, its partners and affiliates together with their respective employees, agents, directors, officers and shareholders, from and against all the liabilities, claims, damages and expenses (including reasonable attorney’s fees and costs) arising from your use of this site; your failure to use the site; your breach or alleged breach of this agreement or your breach or alleged breach of the copyright, trademark, proprietary or other rights of any third party. 13.1. Your privacy is of extreme importance to iTravel-Jerusalem.com. 13.2. iTravelTelAviv makes reasonable efforts under the circumstances to protect the user information and privacy. However, because of the nature of the network, we cannot guarantee full protection for this information. 13.3. The data you provide when registering to the site will be stored in the computerized database of the site. 13.4. iTravelTelAviv will not sell and take the user’s personal information to third parties for marketing purposes without your explicit consent. 13.5. With subscription in the computerized database of this website you agree to receive advertising content, the company shall be entitled to send you by the e-mail and the mail once in a while, information about services and marketing information publications. Whether it is information that it publishes itself, or whether this is the information you receive from the shipping company to other advertisers. If you do not want to continue to obtain commercial information, as stated, you can, at any time, revoke the permission in order to stop receiving information by contacting the site’s commercial e-mail [email protected]. 12.6. User exempts iTravel-Jerusalem from any responsibility for any injury or damage direct or indirect financial or otherwise, caused as a result of the user to leak information, regardless of the cause of the leak. 14.1. All content in the web site is the property of iTravel-Jerusalem.com. It is forbidden to copy or publish any part of any page or content without the prior written consent of iTravelTelAviv. 14.2. All of the designs, text, illustrations, implementation, source code and any other content and/or material contained (whether visible or hidden) in the web site, is copyrighted material of iTravelTelAviv and/or third party content providers and/or business partners of iTravelTelAviv. 14.3. The web site and the contents thereof are protected by the copyright laws of the State of Israel, international conventions, copyright laws and the copyright laws of other countries. The content in the web site is meant solely for personal use and non-commercial advertisements. 14.4. It is forbidden to copy, distribute, publicly display, translate or give to a third party any part of the protected material without obtaining the prior written consent of iTravelTelAviv. 14.5. By submitting and uploading content to the web site, you represent to iTravelTelAviv that you are the rightful owner of such content or that you have first obtained permission to submit the content from its rightful owner. Moreover: by submitting and uploading content to the web site you hereby grant iTravelTelAviv a non-exclusive, world-wide, royalty-free license to: copy, distribute, transmit, publicly display, publicly perform, reproduce, edit, translate and reformat such content without having any obligation to mention User’s name on and/or in connection to such content (The “License”). The License will terminate only when the User will delete the uploaded and/or submitted content. The termination of the license will not affect any sub-license granted by iTravelTelAviv and/or any obligation to any third party that was made prior to the termination of the license. 14.6. iTravelTelAviv’s name, its logos, registered and unregistered trademarks, are the exclusive property of iTravelTelAviv. All other logos, registered and unregistered trademarks, service marks and trade names that are on the web site are the intellectual property of their respective owners. You expressly agree not to copy, download or otherwise exploit all of the aforementioned trademarks without the permission of iTravelTelAviv or the respective owner of such logo, trademark, service mark or trade name. 15.1. iTravelTelAviv responds to notices of alleged infringement that comply with Intellectual Property, Copyright, Privacy and Libel laws. As part of our response, we may remove or disable access to content and/or material residing on the web site that is claimed to be infringing and/or defamatory, libelous, or is an invasion of privacy or publicity rights. 15.2. When serving a Notice of Infringing Material, please define exactly what right has been infringed (such as Copyright, Defamatory or Libel, Invasion of Privacy). 15.3. iTravelTelAviv shall disable or remove access to any content and/or material residing on its servers, within 72 hours after it has received a Notice of Infringing Material. 15.4. iTravelTelAviv will attempt to contact the person who submitted the alleged infringing content and/or material. 15.5. Before serving a Notice of Infringing Material, we encourage you to contact a lawyer to better understand your rights and obligations under the applicable laws. 15.6. The following notice requirements are intended to comply with iTravelTelAviv rights and obligations under the applicable laws and do not constitute legal advice. • Your declaration that you believe in good faith that the use of the mentioned content and/or material is not authorized. • Your declaration, under penalty of perjury that the information you provided in the Notice of Infringing Material is correct and accurate and that you are the owner of the alleged infringed rights or you are authorized to act on behalf of the owner of the aforementioned rights. • Your signature (electronic or physical). 16.1. The web site includes commercial content such as advertisements and marketing material that are posted on behalf of various service providers, advertisers or users, who seek to offer goods or services for sale (“Marketing Material”). Marketing Material may be expressed by text, images or sounds. 16.2. iTravelTelAviv will not be held responsible for Marketing Material posted on the web site. 16.3. iTravelTelAviv does not create, monitor, verify or edit the Marketing Material and/or the correctness and/or the appropriateness of such Marketing Material. The responsibility for any Marketing Material and for any consequence of user reliance on such Marketing Material. The fact that third parties are capable of posting such Marketing Material on the web site does not mean that iTravelTelAviv recommends and/or encourages the Users to purchase the services, the goods or the services offered in such Marketing Material. 16.4. Any transaction made further to Marketing Material posted on the site shall be negotiated directly between the User and the relevant advertiser. iTravelTelAviv shall not be a party to any such transaction and it shall not be held responsible for any of the goods and/or services offered in or purchased based on such Marketing Material. 17.1. iTravelTelAviv may include in the web site various kinds of promotional activities, including, but not limited to raffles, vacation packages which may include flights, car rentals, hotels and restaurants, food vouchers, gift certificates, cash prizes, entrance tickets and coupons (Hereinafter: “The Promotions”). 17.2. In order to participate in such Promotions, You may be required to register or sign up to the web site and /or to the specific Promotion and to provide us with information, including, but not limited to your e-mail address, your personal address details (such as state, country, province, city, street name and number and zip code) and the like. 17.3. By participating in the Promotions you agree, on behalf of yourself and any participating user under your legal guardianship, to be bound by these terms and conditions, as well as the specific terms and conditions of the afore said promotions. 18.1. iTravelTelAviv may include in the web site various kinds of surveys and questionnaires, including, but not limited to surveys and questionnaires regarding User’s experience and satisfaction, usability of the web site, User’s experience and satisfaction from any third party information provider and/or service provider or supplier of any kind and the information and/or service the User has obtained from such third party. 19.1. iTravelTelAviv may include an online shop in the web site, in which the User may buy merchandise as well as vacation packages flight tickets, car rentals, hotel and restaurant reservations. 19. All commerce being made in the web side is being made at your own risk. iTravelTelAviv will not be held liable for any of the transactions and/or commerce You choose to make with any third party. 20.1. iTravelTelAviv reserves the right to immediately terminate your use of or access to this site at any time if iTravelTelAviv decides at its sole discretion that you have breached this agreement or any relevant law, rule or regulation or you have engaged in conduct that iTravelTelAviv considers to be inappropriate or unacceptable. 21.1. This Agreement and any operating rules for the web site established by iTravelTelAviv constitute the entire agreement of the parties with respect to the subject matter hereof, and supersedes all prior written and oral understandings and agreements between the parties with respect to such subject matter. 21.2. This agreement shall be governed solely by the laws of the State of Israel, without giving effect to any conflicts of law principles. 21.3. Any dispute which may arise between the parties, including disputes concerning the use of the web site and/or concerning these terms and conditions, as well as the specific online agreements relating to certain services on the web site, shall be brought before an arbitrator who is an attorney proficient in the field of electronic commerce and internet law, and whose identity shall be determined by the chairman of the Israel Bar at the request of any of the parties.